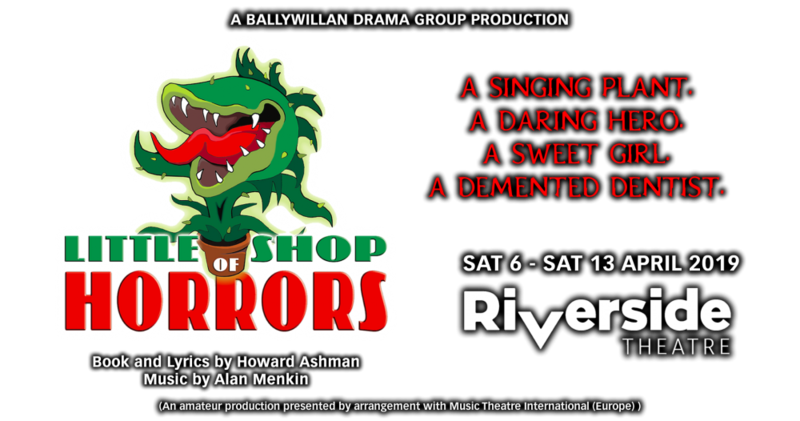 Two months after the most fantasmagorical expierence, Chitty Chitty Bang Bang, we are back at the Riverside with a brand new production of the charming, kooky and hilarious musical comedy Little Shop of Horrors. A must see for the entire family this deviously delicious musical has devoured the hearts of theatre goers for over thirty years and is a classic musical of sublime ridiculousness. Featuring many of the stars of Chitty the musical tells the story of Seymour who happens upon a strange plant, which he affectionately names “Audrey II” after his shop co-worker, who he is secretly in love with. Little does he know that his unusual plant has a few surprises in store! Little Shop of Horrors is that rare theatrical beast – a chance for the actors, and audience, to relax and totally enjoy themselves! For a happy, moving, funny and top quality evening at the theatre, full of great music and songs, book your seats now for Ballywillan Drama Group’s superb musical comedy.